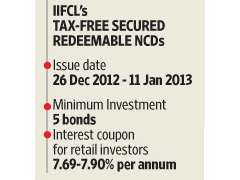 The third set of tax-free bonds IIFCL is about to get launched on 26th Dec,2012. The issue is worth Rs.1,500 crore for secured redeemable non-convertible bonds from India Infrastructure Finance Co. Ltd (IIFCL). The face value is Rs.1,000 per bond. The annual coupon is 7.19-7.90% per annum depending on the tenor and category of investors. Retail investors would get extra 50 basis points on interest offered. So you can earn up to 7.69% per annum for the 10-year bond, 7.86% for the 15-year bond and 7.90% on the 20-year bond. The enhanced coupon rate for retail investors is available only to the original holder and not if the bond is bought through an exchange post listing. Interest is payable annually on dates specified in the prospectus. Credit Rating – Highest credit rating AAA from CARE, ICRA, Brickworks. Issue mode – Investors can choose either demat mode or Physical mode. How you can compare this Bond with PPF & FD? 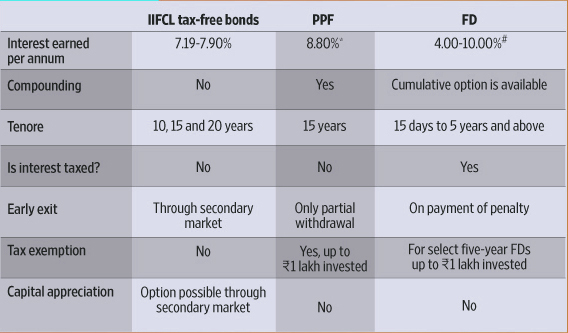 Comparing post-tax returns of other fixed-income instruments such as fixed deposits (FDs) with tax-free bonds shows a definite yield advantage for investors in the highest tax bracket. For a one-year FD offering 9.5% per annum, post-tax returns for those in the highest tax bracket are around 5.8%, much lower than what these bonds are offering. But if you are in the 10.3% tax bracket, the post-tax return in the same FD would be around 8.5%, which is better. You can invest in this only on need basis after other long-term investment avenues have been exhausted. Public Provident Fund, for example, where interest is not taxed, offers a better annual rate of 8.8%, which is compounded annually. While doing investment please keep in mind that Its always quite difficult to predict future of Interest rates for longer period like for 20 years and investing in such bonds can prove Positive as well as negative for investors.